Showtime for this month‘s release: Juno! 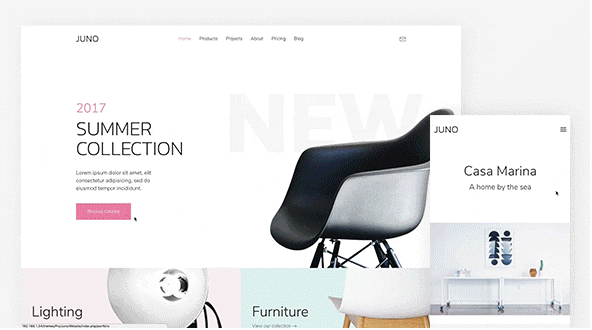 Our June 2017 theme for Joomla and WordPress presents interior, architecture and furniture related content in 7 well-matched layouts. It comes with a bunch of new features from the latest YOOtheme Pro version 1.7, like the much anticipated Parallax effect as well as the Popover and Newsletter elements. All these are perfectly integrated into the light and modern style of Juno. The tiled layout and use of pastel colors make this release stand out.